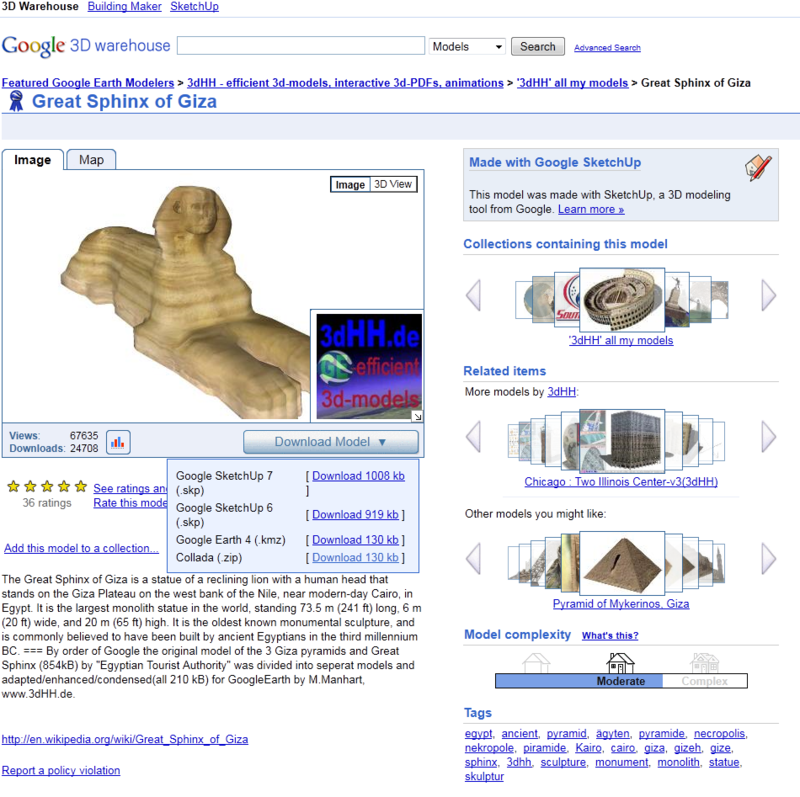 – Step 1: Find the Sphinx on Google Warehouse. Finding cool things in Google Warehouse is easy. Just search for keywords and browse the thumbnail images until you see something interesting. We’ve found our Sphinx! Click the Download Model button and download it as a Google Sketchup 7 file. – Step 2: Convert the model to an FBX file using Google Sketchup Pro. Good question. You have the ability to pull Collada models into the Unity editor. But in practice, I’ve often found that the Collada models simply don’t import properly. In my experience, pulling an FBX file into the Unity editor works much more reliably. Only the Pro version of Google Sketchup allows you to save models as FBX files. But that’s not a problem. If you download the trial version of Google Sketchup Pro, you can run it for a total of 8 hours of actual use. If you’re like me and are only using the trial version to open and export/save files, you’ll get a lot of use out of it before you have to pay for the upgrade. 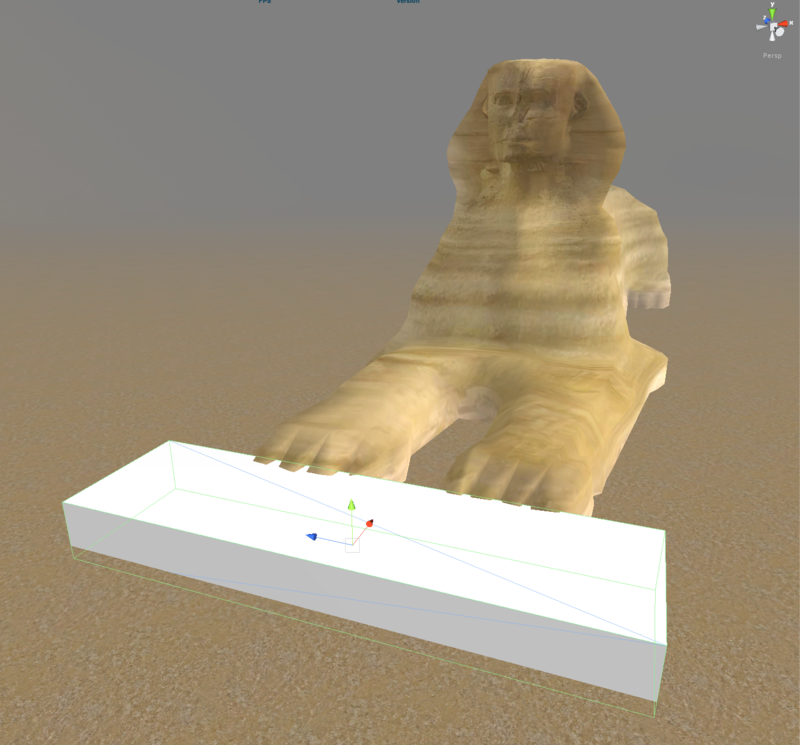 So go ahead and open up the Sphinx model in Google Sketchup Pro, then use File > Export > 3D Model to save it in FBX format. – Step 3: Pull the FBX model and texture file into Unity. 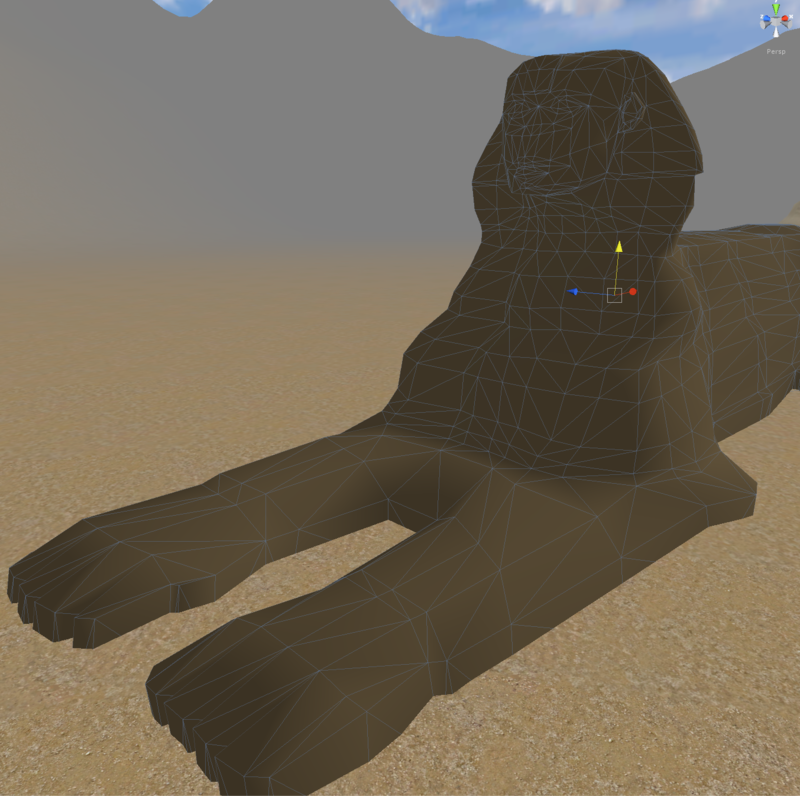 Find both the .fbx model file and the .jpg texture file for the exported Sphinx, and drag them both into your Project window in the Unity editor. 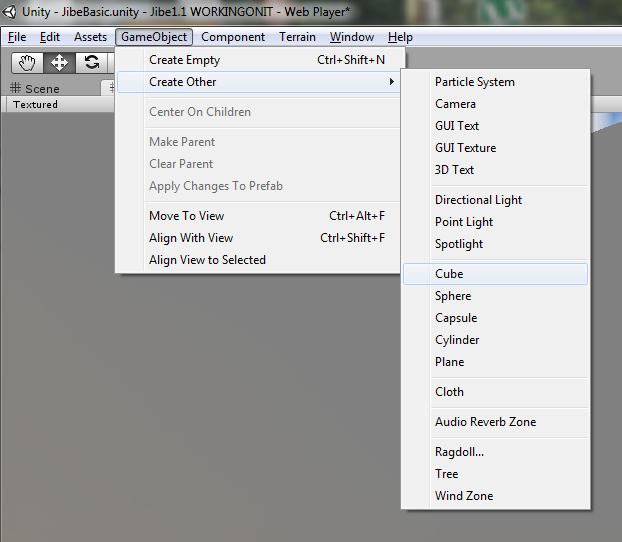 Then drag the .fbx model from your Project window into the Scene window. 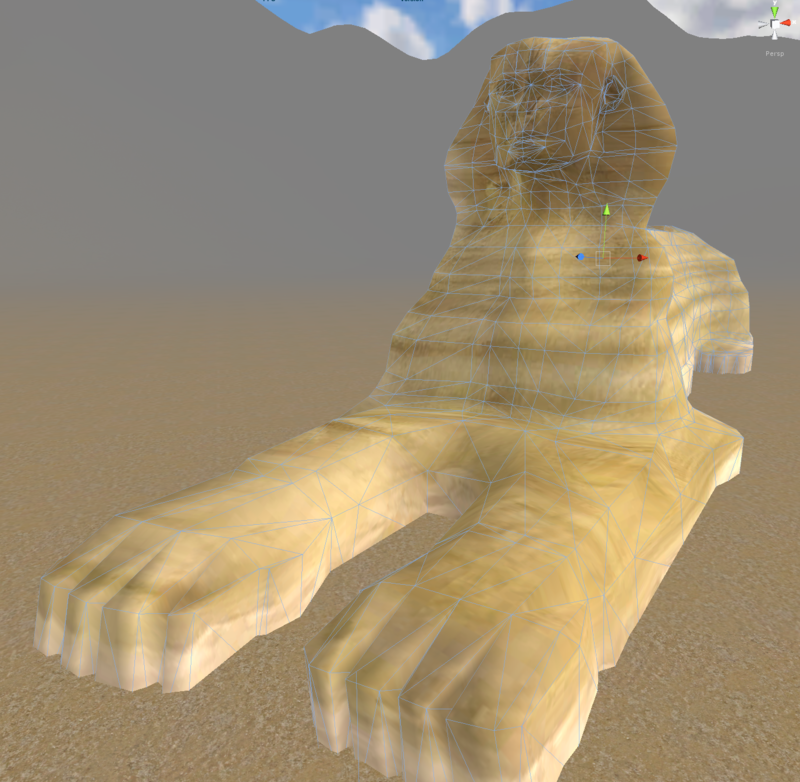 As you can see above, your Sphinx will initially be missing its texture. To fix this, just find the .jpg texture file in your Project window and drag it onto the Sphinx model in your Scene window. That will apply the texture to the model. Sphinx with texture. Much better! 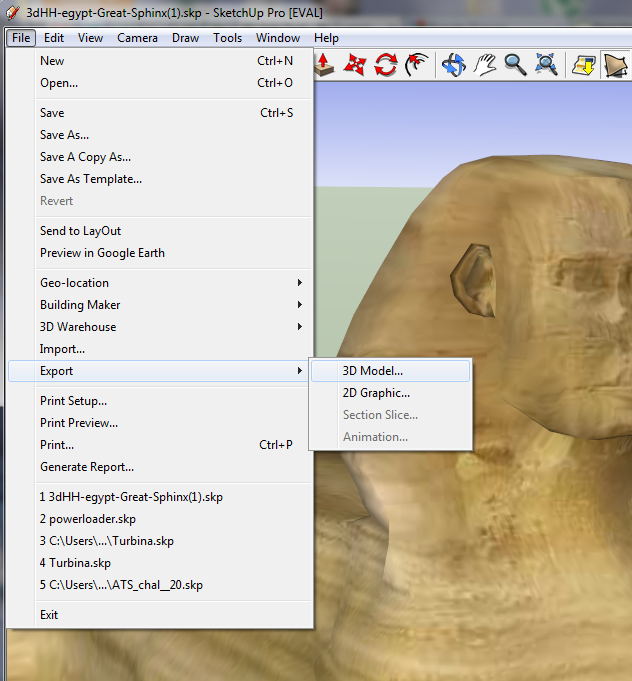 – Step 4: Make the Sphinx ask a riddle! 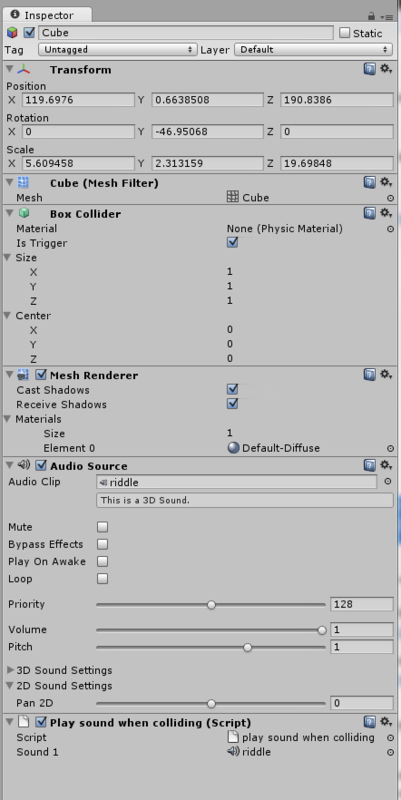 I explained in a previous blog post how to set up a basic Trigger in Unity that will cause a sound file to be played when an avatar walks into the area defined by an object. Please see that blog post for how to set up the trigger script. The only difference with the Sphinx is that we’re going to use a cube GameObject as the collider, and the sound file we’re going to play will be a recording of someone reading a riddle aloud. Using the cube to define the trigger area that will cause the riddle to be played. The cube is now scripted and ready to go. Just remember to uncheck the box next to Mesh Renderer so people won't actually see the cube. Done! Use the Unity editor to build your webplayer file and upload it to your Jibe server. 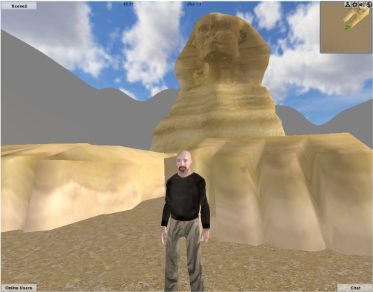 Now you have a giant realistic Sphinx that will ask a riddle whenever any avatar walks in front of it. In my own Jibe world, the Sphinx’s riddle is one from The Hobbit (and the person reading the riddle aloud is J.R.R. Tolkien himself). Ancient Egypt / Middle Earth mashup. Search the forest around my Jibe world for a magical flower garden. From there, you’ll see the Sphinx in the distance. 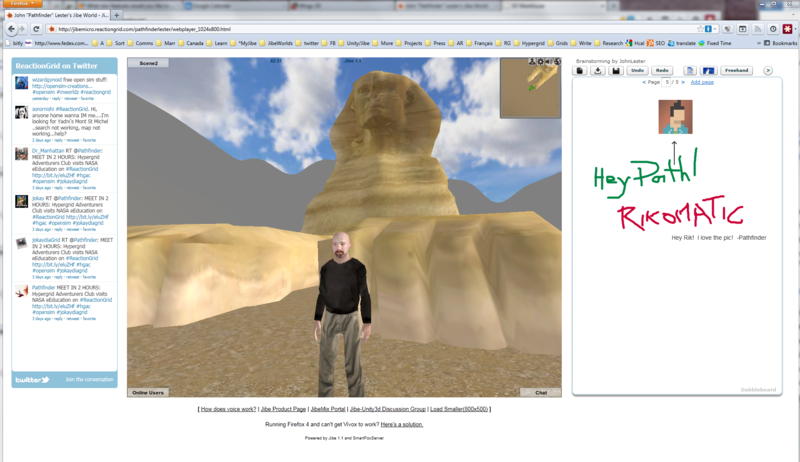 I scaled the Sphinx up so that it’s accurately sized in relation to your avatar, so it’s pretty hard to miss. The answer to the riddle is...? There are many interesting models of historical landmarks in Google Warehouse. Try importing a few into your Jibe world to give your visitors something fun to discover! This entry was posted in Announcements, Avatars, Education, Jibe, Unity3D, Virtual Worlds and tagged avatars, education, Jibe, learning, online communities, ReactionGrid, Unity, Unity3d, virtual worlds by John "Pathfinder" Lester. Bookmark the permalink. As a folelw content creator, I share your concerns over the integrity of IP, but to be quite frank this article came off as a rather flimsy and ill-informed scare piece. First, to your concerns about pirated content: Yes its currently a problem, and it probably will always be a problem, given the nature of digital content. As shown by the evolution of content on the regular old 2D internet, attempts to clamp down hard on piracy by way of restrictive technology almost universally fails, while a healthy ecosystem of communication and reporting does a far better job on keeping it at a tolerable level. To this end, Opensim is making some big strides, such as Diva Canto’s recent work to preserve creator information across the Hypergrid. This will help improve accountability and security. In short, there’s a active effort to try to improve the situation.Now, to your concerns about malicious code and a coming plague of malware that will sweep across the Metaverse. Frankly, I’m really not sure where you’re getting this from. Right now, Opensim is constrained to pretty much the same LSL scripts that SL uses, and those only run on the servers. Furthermore, their power were intentionally limited when LSL was first designed to prevent any sort of systemic damage. The most risk you would run is by downloading a new and untested viewer, which does have deep access to your computer and could be made malicious. Finally, the Hypergrid needs freebies. Without any sort of unified or battle-tested currencies ubiquitously deployed, freebies are the only way grid owners can offer content to new adopters. Of course they should strive to find legitimate content, and perhaps there’s a need for a universal creative-commons licensed community library of donated content for grid owners to draw from. Implying that one should not trust any freebie of quality because it *might* be pirated does nothing more than confuse the issue.